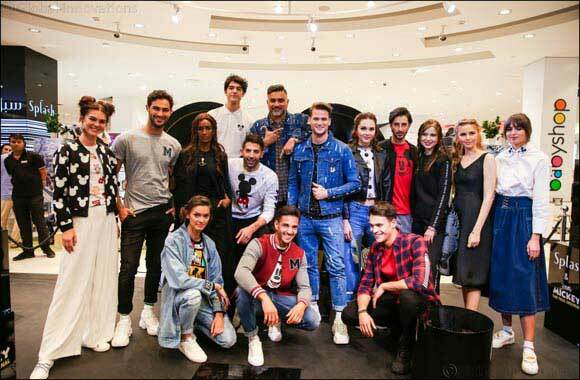 Dubai, UAE, October 28, 2018: The global celebrations of Mickey Mouse’s 90th Anniversary have taken the fashion scene by storm, seeing fashion houses around the world pay homage to the true original with one-off creative collaborations. As the leading fashion retailer in the Middle East, Splash Fashions is once again leading and setting trends with the launch of its very own capsule collection for the GCC. For the very first time, and in keeping with its locally-minded ethos, Disney and Splash invited four sought-after local faces to join its design team in order to express their individual interpretation of Mickey Mouse’s legacy. The influencers involved in this playful design opportunity are; Mohannad Al Hattab, Mathyel Al Ali, Fouz Al Fahad and Ahmed Al Nasheet. Invited behind the scenes at Splash’s in-house design department, these four hand-picked influencers began their dream co-designing their very own limited-edition collection alongside the Splash design team. Each individual was allowed the freedom to experiment with potential design options using iconic imagery of Mickey to create these unique pieces. Creative brainstorming, laughter and learning played a big part of this process and both Splash and the design group are incredibly excited by the results as seen in the new collection. Mohannd, Mathyel, Fouz and Ahmed will be visiting select stores in KSA, Bahrain , UAE and Kuwait over the coming weeks to launch their designs and the collection, which are available in select Splash stores across the GCC region. This collaborative approach from Disney and Splash Fashions highlights their priority and commitment in reconnecting with the communities in the region. Following closely in the footsteps of the recent #InFashion campaign, Splash Fashions is building close relationships with its consumer and the local culture and diversity of the GCC. The anticipation for this fun-fuelled collection was introduced with a high-energy in-store fashion presentation. At the Splash stores designers joined forces with the Hassan Al Sheikh, from Star FM Radio, to introduce the Disney range directly to the local community and Splash Fashions fans. Guests were invited to soak up the fashion ambiance, browse the collections and take part in various live competitions for the chance to win a number of Mickey Mouse related prizes in celebration of #Mickey90. Next Story : FENDI MANIA A Legendary Drop for Women-Men-Kids!